For a big city, Memphis has its fair share of green spaces, but when it comes to unlimited running it doesn’t get any better than the Shelby Farms Greenline, which stretches over 10.5 miles from Midtown Memphis to the Cordova neighborhood. It’s highlight is the spacious, lake-speckled Shelby Farms Park (a running destination in itself), but you can pick and choose your mileage along the length of this paved bike path. If you’re coming from town, you can pick up the path off of Tillman Street in Hayden Place, just before it crosses Cypress Creek. From there, it’s about 5 miles to the halfway point where the the Wolf River flows into Shelby Farms Park. If you get tired at any point, the 340 bus line, which runs along route 23, can return you to town. There are access points at Tillman Street, HIghland Street, High Point Terrace, Graham Street, Waring Road, Podesta Street, Sycamore View, Farm Road at Mullins Station Road, Whitten Road, Appling Road, Raleigh LaGrange Road, Germantown Parkway, Cully Road, A Street, and B Street / Macon Road at the Cordova Depot. 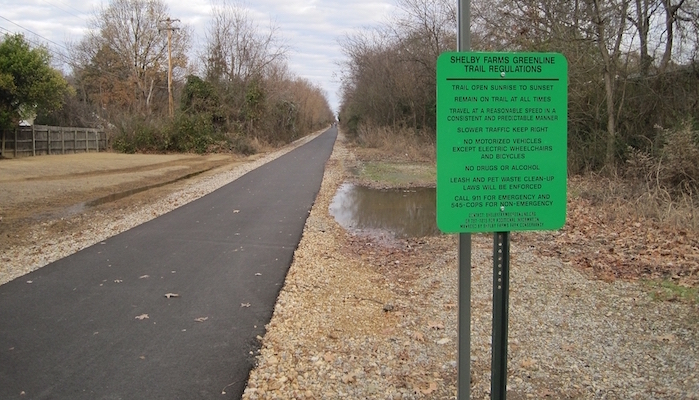 Add-On: Shelby Farms Park has 40+ miles of trails. Trail info here. Tillman Street near Walnut Grove Rd.